Anyone can blog. Create text, audio or video content and distribute it via feeds (aka RSS), email and/or social sharing to become a media entity. However, blogging underscores the need to develop quality content that lays the foundation for thought leadership and builds an audience that leads to business success. 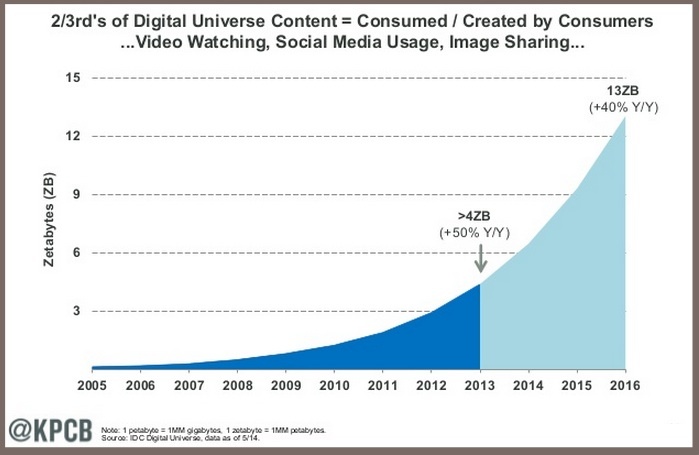 The challenge facing bloggers, especially newbies, in 2015 is breaking through the tsunami of information. It’s not just other bloggers, you’re up against short-term tactics like formulaic clickbait and non-stop social media updates. Problogger’s Darren Rowse believes there’s an opportunity to stand out as a blogger by creating meaningful content that wins readers’ hearts and minds. With 5 years of blogging experience, I’ve found that Actionable Marketing Guide provides the basis for credibility and trust for readers, students and clients. What information does your audience need to make their lives and/or jobs better? What content will entertain and delight them? Get your copy of the definitive blog checklist! 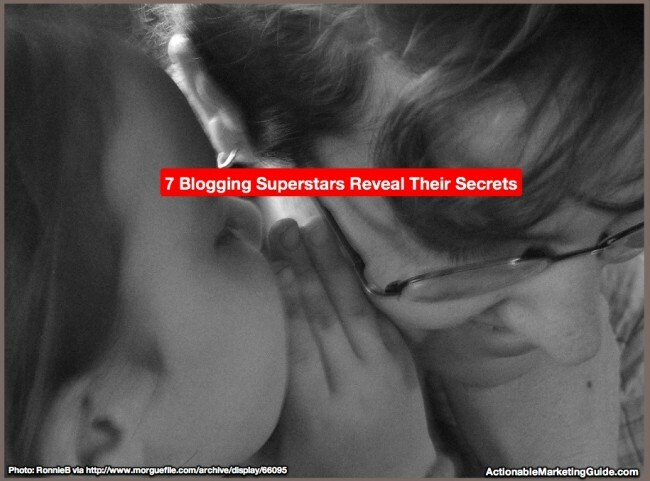 Here are the 7 steps to build your blog to yield measurable business results based on the secrets from 7 blogging superstars. 1. 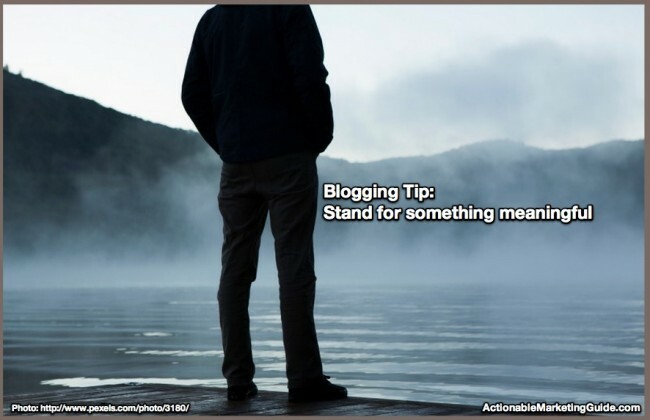 Stand for something meaningful to you. Face it, if you’re not passionate about your blog’s focus, you won’t want to keep showing up at your computer. Take it from me. Blogging is VERY hard work. The experts just make it look easy. 2. 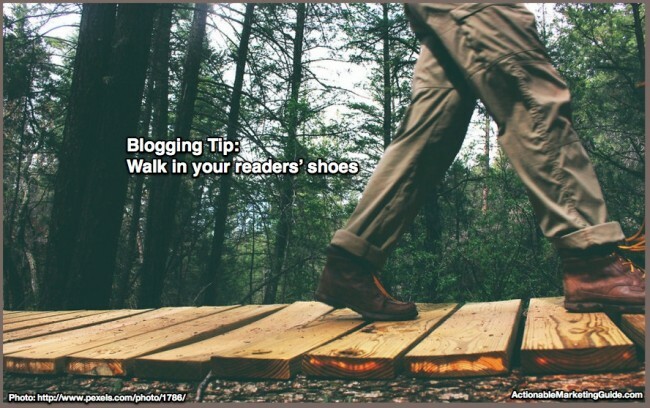 Walk in your readers’ shoes. For your blog to truly help your readers, you have to know them as if they were your best friends and write to them as if you were speaking to them directly. Start with a data driven marketing persona. Enhance this information with an emotional understanding of your readers. Tap into their dreams, fears, passions, desires. Where possible, survey them or use your initial email confirmation to find out what their pain and pleasure points are. 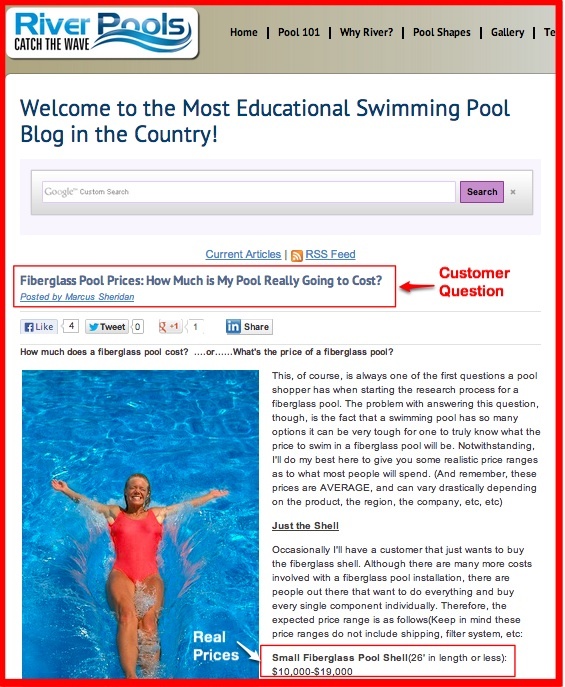 Provide blog information to support the post-purchase process. Think product use, cross-sell or upsell and raving fans. 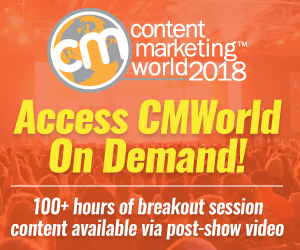 At SMMW15, Darren Rowse asked “How will your audience be changed as a result of reading your blog?” Use this question to generate article ideas. For example, Rowse wanted to help his Digital Photography School audience to improve their photographs by moving away from the automatic camera settings. 3. 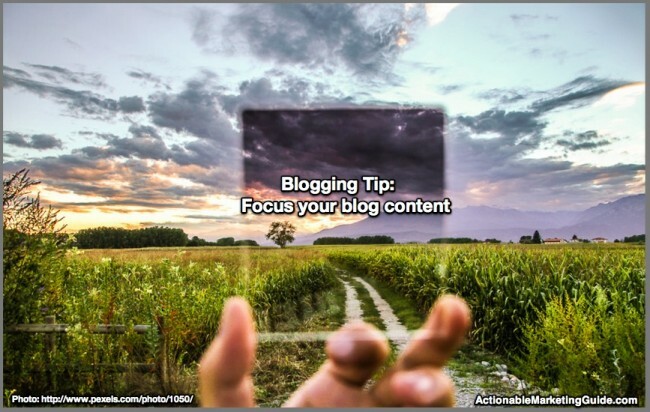 Focus your blog content. “When it comes to blogging, consistency is more important than frequency” according to Michael Hyatt, former chairman and CEO of Thomas Nelson Publishing, the largest independent US book publisher. Blogs are learning centers. This is key to increasing sales today since customers are 57+% of the way through the purchase process before they contact you. View your blog holistically. Manage your blog categories like a book’s Table of Contents (or chapters) and use tags like its index. WP Beginner’s Syed Balkhi consolidates his blog categories every 6 months. He recommends having 5 to 7 categories total. More than that is a sign that your content isn’t focused. Build cornerstone content. Tap into your audience’s passion. This core information answers your audience’s key questions including 201 level information. Develop a series. Get readers interested in on-going chunks of information. 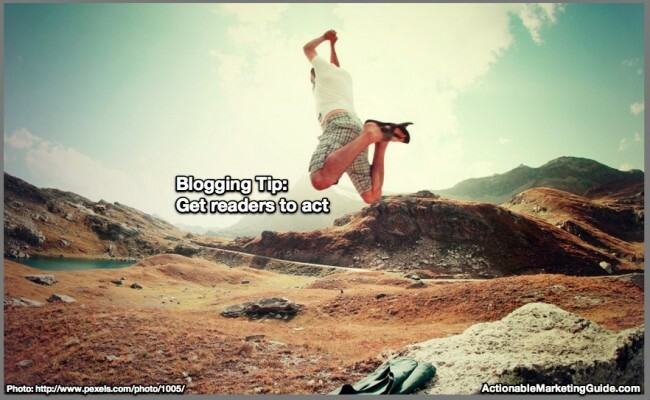 Include a cliffhanger to get readers to show up for more. Publish the content on a predetermined schedule. Tell stories. In Made To Stick, Chip and Dan Heath point out that stories make your information memorable. Think in terms of your business’s once upon a time. Also employee and customer stories are useful. Augment each post with related content. Add checklists, audio or video, infographics, social media updates and slideshares. Create all related content at the same time. Take advantage of your inspiration. You save resources by creating similar but not duplicate content at the same time. You can’t expect readers to arrive at your blog and sign up immediately. They like to be romanced. Develop the customer journey as it relates to your ultimate business objectives. Use this process to help create appropriate content for your target audience. Get readers to join your email list when they’re excited about your business. Namely during the journey. 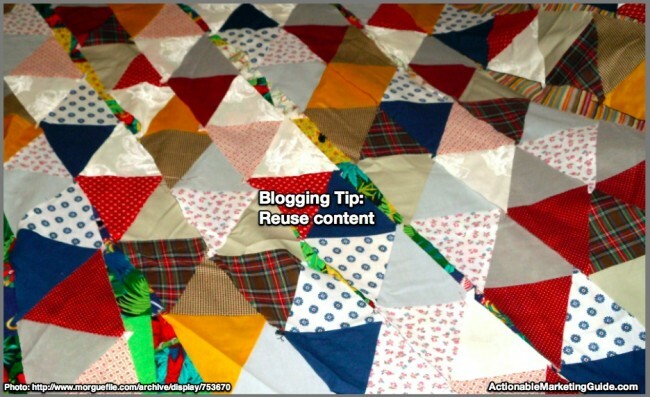 Include resources in the middle of your content. This encourages readers to register. Use plug-ins to improve email registrations. Personally, I use OptinMonster and have gotten spectacular results with this tool. 6. 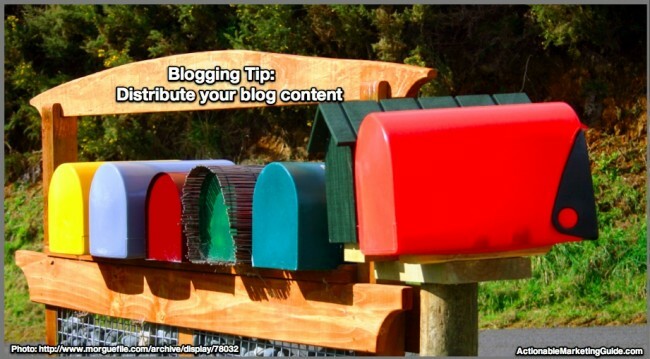 Distribute your blog content. “Social media marketing is distribution for content.” Copyblogger’s Brian Clark. I love Clark’s statement. It reveals the symbiotic relationship between social media and content marketing. When you first publish your blog posts, distribute your content across a variety of platforms to maximize reach. If you stop promoting your content, you stop getting visitors. When I stopped a promotion at The Economist, my boss said my marketing didn’t work because performance fell off. I responded that we needed a new promotion. WPBeginner’s Syed Balkhi recommended the following tools to enhance your reach. Go beyond basic sharing buttons. Test ClickToTweet. It allows readers to just click on a datapoint or quote that you’ve set up. Hand pick your featured articles. Most plug-ins will select your top articles but these already get most of your traffic. Instead select your older content that you feel needs more love. Batch your social media shares. Don’t just focus on your current post. Balkhi recommends creating a spreadsheet and retweeting 4X per day. Speed up your blog. No one is going to wait for a slow connection. Dig deeper into Google Analytics. Stan Smith recommends tracking your CTA pages. Based on your performance, you can optimize them to improve conversions. This is where the sales action is. How much do you currently make on your blog by product or service? How much do you want to make on your blog by product or service? This forms a simple matrix. At its heart, it’s budgeting 101. But the genius is in the simplicity. I’ve taught a lot of marketers how to do marketing finance. Don’t assume that each product will or should grow evenly by X%. Examine which products or services bring you the most profit per effort. 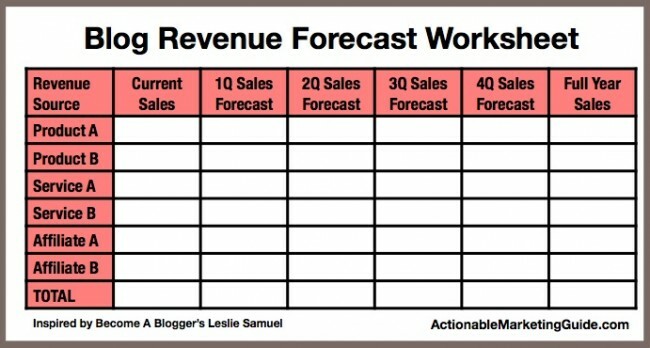 This helps you determine the content your blog needs to achieve your business goals. Building an effective business blog takes hard work. It requires more than just jumping on the latest trend or fooling your readers with empty clickbait. It’s not a matter of being the world’s top blogger. It’s a matter of reaching your core readers who want what you have to offer that’s special to them. What other blogging tips to help improve your business would you add to this list and why? Tags Andy Crestodina, Brian Clark, Darren Rowse, Leslie Samuel, Marcus Sheridan, Michael Hyatt, Stan Smith, Syed Balkhi. Bookmark the permalink. 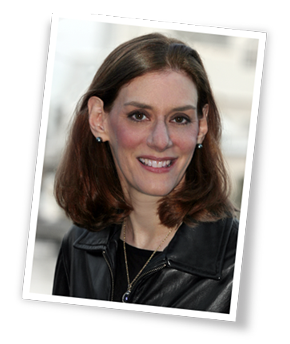 Hello Heidi, I just wanted to let you know that I think this article is spot on and I did a post about your article on my blog. If you would like to see it please go to: http://superprofitflow.com/2015/05/11/tips-drive-mea…e-results-blog/ I did mention you by name in the post as well as a link back to this article for people to enjoy the full article. Have a wonderful day!